OK, we may be off to a bad start. 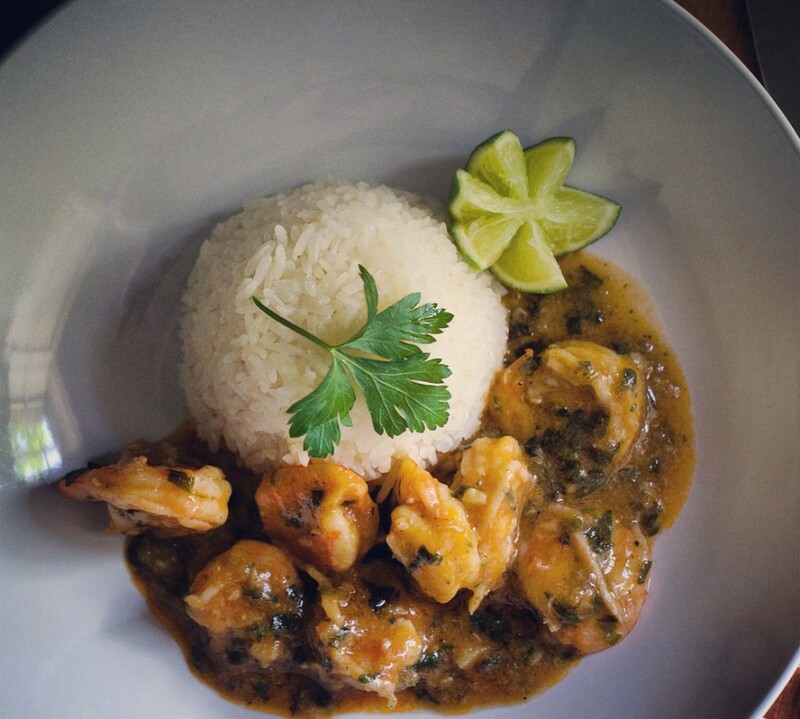 I know I said I was going to focus on Latin-Caribbean cuisine, and I will. Just not this time 🙂 Lo siento. I thought about typing the post in Spanish, but then you would either a) have to deal with some unreliable online translation tool, b) think I’d lost my mind and move on or c) not get to enjoy this awesome salad. My hope is that this salad will make up for my transgressions. Let me start by saying…, I’m NOT a salad gal. Hey, I’m a Latina, we don’t eat salads. Well, that ‘s not true. We do. I don’t. I try, but I’m usually disinterested. Every now and then I do find a winner. Like Houston’s Cobb Salad. Or the salads at sushi restaurants with that awesome ginger or peanut dressing. But those are not the salads I want to talk to you about. This salad is unusual. It is fresh. It is satisfyingly meaty and meatless. This is a Poached Mushroom and Asparagus Salad. I’ve been hearing about poaching meats and vegetables in olive oil. It seems to be one of the ‘it’ cooking methods at the posh places these days. Poaching is generally done using a well-flavored broth, sometimes wine, that is kept at a consistently low temperature. The idea is to slowly cook the ingredients without ever bringing them to a boil. I used a medium-sized skillet and added about 3 cps of extra virgin olive oil. Don’t fret, you will save the oil and reuse it. Because the oil is never very hot, you don’t burn it, which allows you to use it time and again. There really isn’t a recipe here, but here’s what I did. To poach the mushrooms: clean and slice the mushrooms. If you are using portabellas, make sure you remove the brown gills. Otherwise your oil will be dark brown. While you get the mushrooms ready, put the oil in the skillet and turn the heat as low as your stove will go. The oil’s temp should be between 160–185°. Once the oil comes to temperature, add the mushrooms. It is important that they be completely submerged in the oil. You’ll know the temperature is right if you see little bubbles slowly forming around the mushrooms. Poach the mushrooms for about 15 minutes or until tender. 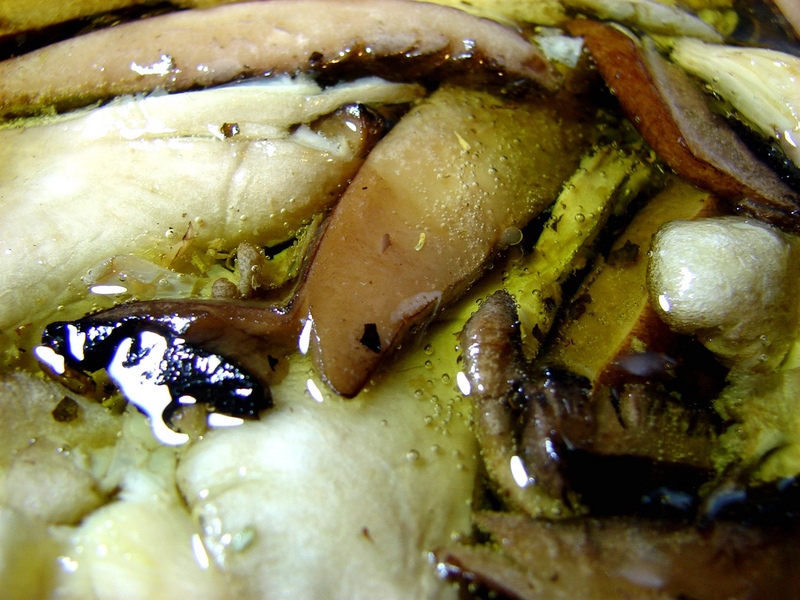 Once the mushrooms have softened, remove them from the oil and drain. Allow them to cool. Meanwhile, prepare the rest of the ingredients. Blanch the asparagus: bring a pot of water to a boil. Add salt, then drop the asparagus in the boiling water. Allow them to cook for about 3 minutes. Have a bowl of iced water waiting , remove the asparagus and dunk them in the icy water. Allow them to stay in the cold water for at least 3 minutes. Remove and drain. In a bowl combine the mushrooms, fennel, asparagus and vinaigrette–tossing to coat all ingredients. I used a store-bought white balsamic vinaigrette. Add some of the cheese slivers and toss. Top with more cheese when served. You may think using olive oil as your poaching liquid would result in an extremely oily dish, but it doesn’t. What you end up with is a delicately flavorful bunch of mushrooms. To preserve the oil: If you notice any bits or drippings, allow it to cook longer without the mushrooms. Then strain through a coffee filter and save in a glass or heavy plastic container in your refrigerator. Bring it to room temperature before the next use. I promise you, you will make this one again. And again. Enjoy! Could you substitute mushrooms for something else? Does the ice water bath help keep the asparagus crunchy? I’m willing to try it! As usual your pictures look edible!!! This looks delicious! I’m not a salad person. In fact, I don’t like my leafy greens. I’m trying to learn to like salad though. Abby, I’m with you. I think I’ve come to understand I don’t love salad greens-as in the leafy stuff. Whenever I enjoy a salad, it has less lettuce and more of other veggies. I’m especially loving the addition of lightly blanched asparagus to a salad. I used to only have them served warm, but cold ones are a revelation!!! I hope you’ll try this salad. If you love mushrooms, it is a must have. Chica esto esta por la maceta…. Store the olive oil in refrigerator? I thought people just left it out? I keep fresh olive oil out, but I would suggest keeping the remnants of the one used for poaching in the fridge in case there are any leftover bits floating about. I’ve used that oil again to poach some fish, strained it and it’s back in te fridge. Thanks for bringing that up. Well I’m a salad-kind-of-gal and this totally entices me. Thanks for the idea. I do love mushrooms. What could I substitute for the fennel, I wonder. I am very adverse to it. Thank you once again for your clear explanation.